Music & Movement is a preschool movement program that I just started, based on a program I volunteered with when I was in library school. The kids love it, the parents love it, and I love it. Plus, I can count it as my work out for the day! 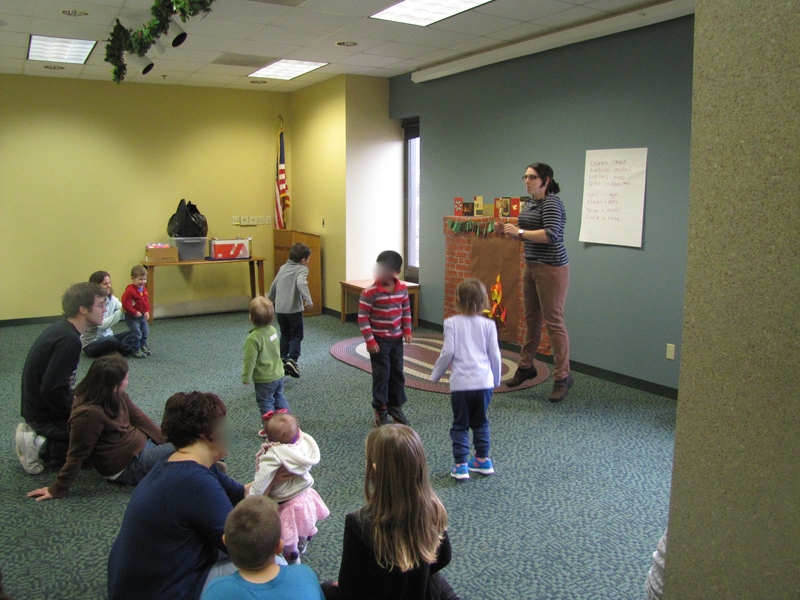 Our program room is pretty big, and has a carpeted area that we use for storytime, and a larger area that generally has tables and chairs set up. I clear out the carpeted area, and parents either on the floor in a circle or at the first row of tables. Bubbles! I start the bubbles about 5-10 minutes before the program is scheduled to start. It’s a great icebreaker, and a way for kids to get over their shyness and join in. I welcome families and explain the rules: Kids are welcome to participate as much or as little as they want, and can pretty much do whatever they want as long as they aren’t hurting another kid. I explain that parents are encourage to join in with the dancing and moving, and that their kids will follow along with them. I also make them all sing with me! Then we sing the bubble song! There are bubbles way up high, way up high. Name Song. We don’t use name songs in any other programs, but after the first two sessions of Music & Movement, I really missed it, so I added it back. We sing about something that each kid is wearing (purple shirt, tennis shoes), and they have a lot of fun looking down at themselves when we say the name. Holly has her purple shoes on, and we’re so glad she’s here! 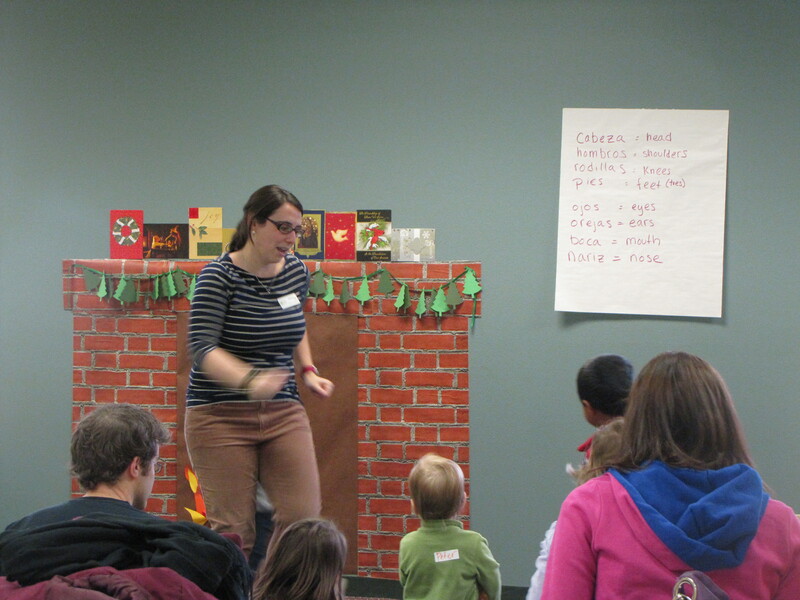 Head, shoulders, knees and toes in Spanish! I put up a big poster with the words in both English and Spanish, and tell the parents that it goes fast! Then we pass out a prop- shakers, ribbons, or a parachute. We use the props for a few more songs, and then we always end with We are the dinosaurs by Laurie Berkner. After the music ends, its time for Books, Balls, and Balloons! I dump out a box of board books and a big bag of balls, balloons and these really cool foam construction pieces. I like your ideas! Can you please tell me more re:Books,Balls and Balloon time. Glad you’re interested! I dump out a bin full of board books (just from the collection, so families can check them out if they want), as well as a big bin full of balls (including some big beach balls) and balloons to play with. It is a free play time, and the kids really enjoy exploring the different toys, learning that balloons are lighter, and reading with their grown-ups. Where did you get your Head, shoulders, knees and toes spanish/english poster? That sounds so fun! I just wrote it out on a big piece of poster paper and taped it to the wall. Easy!